thanks guys - the sources were indeed a little contradictory - "Pierre Martin" in 'Avions' magazine doesn't mention the Bundesluftwaffe at all. Post-war Reinert was "quickly released from a period of detention" and became a medical student, completing an arduous course of study under difficult circumstances before meeting and marrying an opera singer ...it would be interesting to know how/why the change of career came about as I don't have any specific info on his post-war air force service ..
Neil, many thanks for confirming that he did study to become a doctor post-war. Indeed, the sources are rather vague and contradictory as the source that mentions his medical career does not once mention his Bundesluftwaffe career although it too mentioned that he married an opera singer! Obviously this source was based upon the Avions article mentioned by you. However, he certainly did serve in the Bundesluftwaffe from 1 April 1956 when he joined with rank of Major until 30 September 1972 when he retired with rank of Oberstleutnant. Why the career change remains a mystery to me as well. Thanks for clearing that up. It certainly makes more sense. Ernst-Wilhelm Reinert re-entered service as Hauptmann in 1956 and retired as Oberstleutnant Sept 30, 1972. Til 1964, he flew with fighter bomber wings JaboG 31, JaboG 33 and 35, being posted to staff of 3rd Luftwaffen-Division in Muenster afterwards. He ended his career as base commander in Westerland. Sorry to hear this news, Herr Reinert was always willing to help out enthusiasts and historians alike with requests. "Heil Dir im Siegerkranz, Herr Hauptmann". My father was fighter pilot on Mig-21.For me,when a pilot die ,somethink is broken in my hart.Rest in peace,Herr Reinert. did Ernst-Wilhelm Reinert fly the Macchi M.C.205 in October-December 1943 ? He often attended our JG.27 veterans reunions, as he served after being transferred from JG.77. His personality somehow did not please his superior(s) there. His expression was "Ich war immer ein 'sunny boy'". 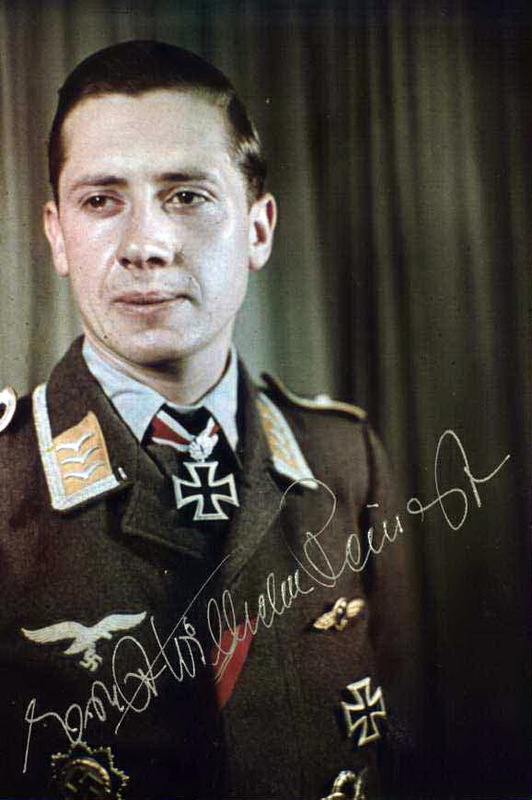 He was photographed in agfacolor on the cover of a 1943 edition of "Die Wehrmacht" a photograph often reproduced. Again photographed in an edition of "Der Adler" during the fighting in Italy, with a fighter unit. Rejoining the Bundesluftwaffe, he was again photographed in color on the cover of "Flug Revue", with new airmen of his unit , during a pre-flight briefing, beside his aircraft. The caption referred to him as a former staffelkapitan of JG. 27. Former Bundeswehr airmen wrote remeniscences of him after his passing. Most notable was when arriving for first posting to his unit, a pilot noticed a figure on the ground firing at him (he thought) shortly before landing. It was Reinert, shooting away at geese who may have endangered the aircraft by bird strike. He also flew with his wingman (Zeno Bauml) in the rear compartment of his 109 during a retreat when he shot down a British Grumman Martlet. A post landing photograph exists of Bauml energetically relating the incident, can't find my copy but it was published somewhere. His degree was as a "Naturopath" and I did have a consultation with him, a very knowledgeable and earnest Doctor. As for the Macchi use in JG.77, the former adjutant Fritz Broschaitis (nicknamed bronchitis!) related the use of that aircraft but the men we spoke to (at reunions) admired the aircraft, but NOT the throttle, which was the reverse of the usual, i.e. Forward was to retard the throttle, and rearward accelerated it. Most of the men I spoke to did fly it, but we're not forced to if uncomfortable with it. While the workmanship was praised, the spare parts availability was certainly not. Broschaitis was also in JG. 27, and later in the Bundesluftwaffe, a friend of Reinert there as well as in wartime. If memory serves me well, Reinert did fly the Macchi, but not much. His contemporaries spoke of him as a 'natural' flyer, a very high compliment.